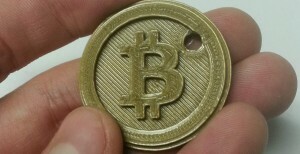 First, we are now accepting Dogecoin for our 3D printing services. If there’s something you want such as a cover for your Google Glass camera (http://www.thingiverse.com/thing:182763), or a stand for your Google Glass(http://www.thingiverse.com/thing:118339), or something which doesn’t at all relate to that product at all – we now quote prices in Dogecoin! (Yes, we still take BTC and LTC). Much additive manufacturing! Such adoption! Store your private keys (wrap it in foil to prevent stray scanning)! Theoretically you might store a variety of public addresses for different coins, so that people can pay with what they wish (still looking into this). Additionally, we realized that you could use CryptoPrinting’s #Dogetags as real-world dogtags and store your contact info on a little 3D printed tag attached to all your canine pals! Or use your dog as your bank and keep the private key on him! You do what you want to do with it; out-of-the-box thinking encouraged. Very printed, much wow! 2. We need to choose a consistent model or models to help facilitate #1, which we could make a fun contest out of. There are a few Dogecoin models on Thingiverse but they all have different problems, either in their design, or some kind of non-manifold STL, which resists repair. If there’s anyone experienced with running a fair crypto-driven contest, we would like some input on how to do it well. 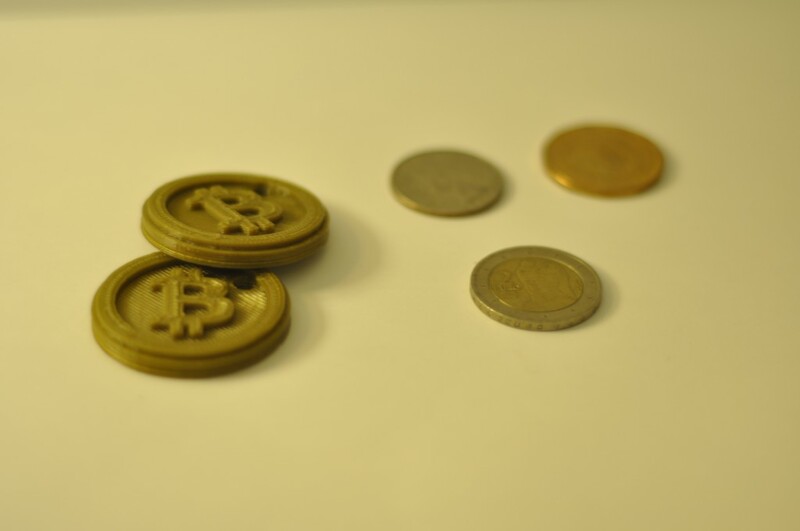 Model Design requirements: We need a recognizable coin with a hole in it, which is sized to allow an NFC tag to be inserted during printed without overlapping the hole. In general our other coins are around ~3.8cm in diameter, for comparison. 3. I cannot possibly supply the larger needs of pet lovers alone should this catch on. In an effort to deal with this proactively, while also celebrating one year of operation, I will be open sourcing the NFC coin-making process, hopefully giving anyone with access to NFC stickers and a 3D printer the tools required to make their own #Dogetags. 1. We need to solve the 3D model/STL problem first through the design contest. I’d like to make it as democratic as possible with rewards going to the winning designer, but if we can reward all participants – great! 2. 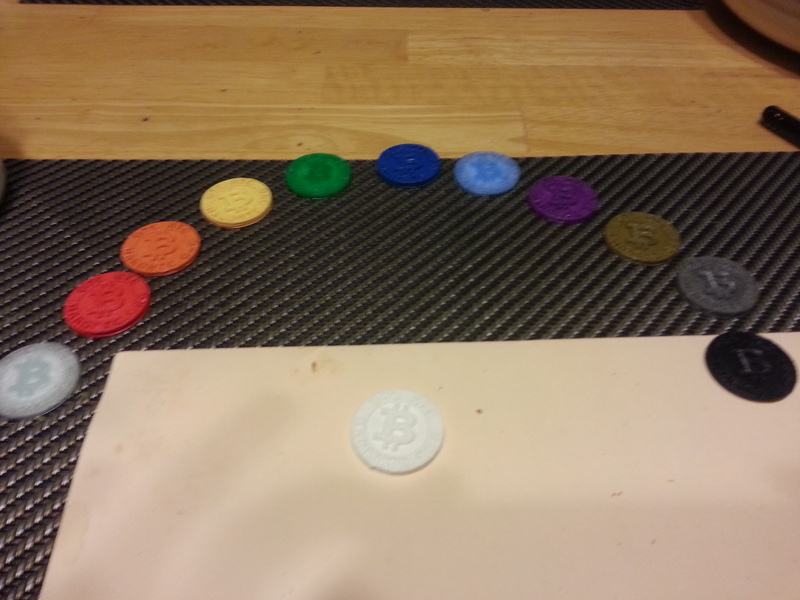 Once the model is chosen and I’ve made sure that the NFC/printing part is working, the open sourcing of the process will be developed so that others can make their own coins. From there on out it’s mostly an information campaign “If you find a dog with this on, scan it and return them please!” Anyone who wants one can make their own, and those who want to purchase one are welcome to do so. 3. 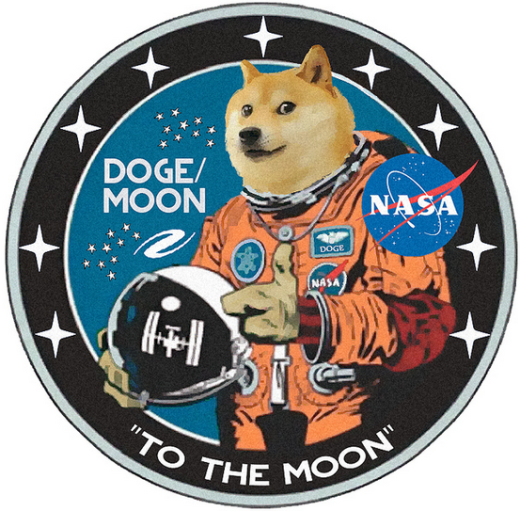 After that point, CryptoPrinting will take orders until I’m booked solid, then I’ll start looking to scale our local operation, build a more distributed printing network as needed, or otherwise rely on people to create their own #Dogetags. Such a network would also need some decentralized reputation network to build off of, which I’m not sure exists yet. Either way, very excite! Much opportunity! It’s a brave new world in Cryptoland! I wanted to pass some information along that will be useful to you and anyone else who happens to want to use our NFC for Bitcoin/altcoin related purposes (particularly putting a public address on an NFC tag for others to pay to). 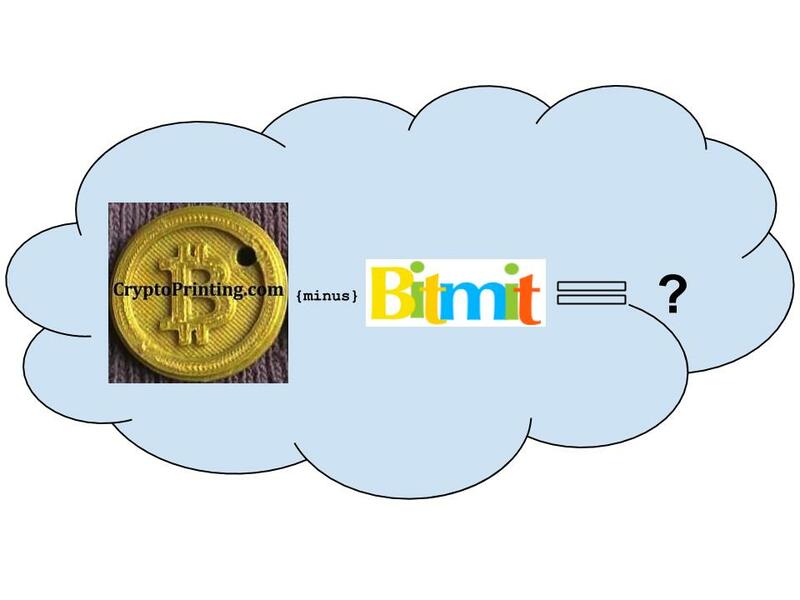 Unfortunately, with the closure of BitMit and a slapdash attitude toward record keeping on my part, a large fraction of my customer’s email addresses have been lost (if I ever had access to them in the first place). I like to think that this shows I’m not the kind of person to hoard your private information, as opposed to revealing that I am a scientist/engineer trying to play business-creature, but take it as you will. The practical result of this is that it is difficult to communicate privately with all of our past customers and we think this information is worth sharing more broadly anyway. If you find the information valuable, please consider tipping the OP, whose address is listed in the reddit post. 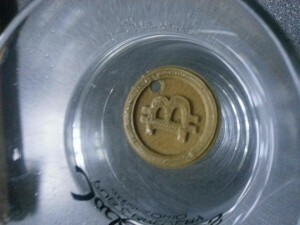 Our Crypto-Coins Are Waterproof & Buoyant! 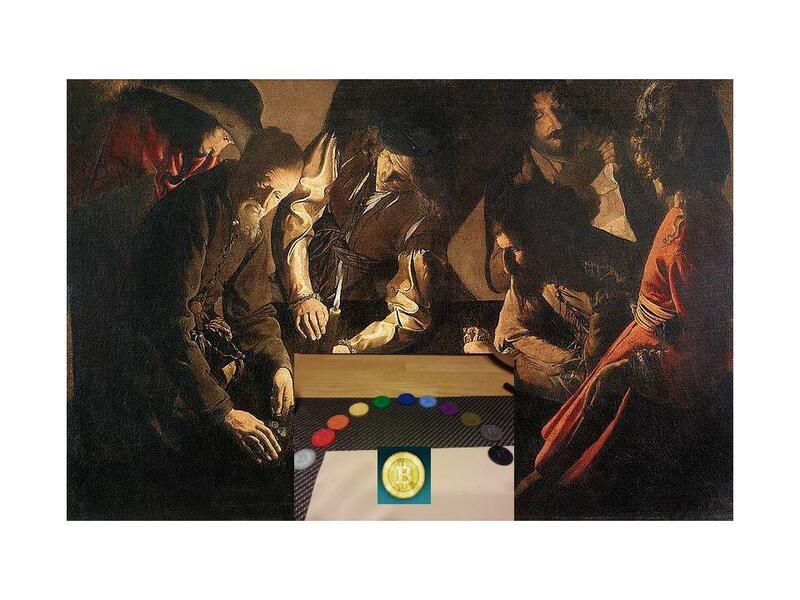 We recently decided to test out our cryptocoin simulacra to see how waterproof they really were. The results? Not only are your coins waterproof, but they also FLOAT!! The printing process traps small pockets of air into the coin, which allows it to float! After giving it a short bath (with dunking), the NFC tag inside didn’t have any functional (read/write) problems at all. For a while, we were confused why the NFC stickers we embed into your 3D prints were not considered ‘waterproof,’ while other NFC tags were. What makes one of these tags waterproof? It turns out that it’s all in the plastic coating around the tag. This coating prevents the device antenna from becoming deformed or otherwise breaking when the tag gets soggy. In that sense, embedding the tags into our 3D prints might be considered it’s own kind of waterproofing. *We will be conducting a similar test of longer duration soon, but thought that this information was worth passing along. That being said, anyone who has already written a private key to their tag should continue to exercise all due caution. You wouldn’t dunk your laminated laptop into a bathtub, would you? This 3D Printed Bitcoin simulacra contains a 1k Mifare Classic NFC sticker embedded into a bitcoin token made of gold-coloured PLA. The whole ‘coin’ is ~36.7mm in diameter. Sold as blank slates – NO account or key-related data would be written to the NFC chips upon purchase. I can’t promise that we won’t put our own website onto it to be cute. Load a link to any website or a link to your account on the blockchain which then shows your account summary! We are considering offering these on a regular basis, but wanted to auction one to see what the interest levels are. As the auction has recieved bids we will be including these with the next 3 orders, and begin offering them as a regular product after that on bitmit.